With only two days to go Becky couldn’t put if off any longer – she needed a fabulous new bikini, worthy of a Vogue fashion shoot. She usually went shopping with her hair scrunched up in a mess and no make-up on, but bikini shopping demanded a little more attention. Perfectly curled lashes and styled hair were required to soften the blow when she looked in the mirror of the changing rooms and saw her pale, post-Christmas stuffed body staring back at her. After sorting though the awful selection of swimwear the shops have in January, Becky finally found a matching top and bottoms, and her much anticipated holiday could finally start. She’d been to Sri Lanka before and fell in love with it all over again as soon as she landed. It has an exotic charm that kept you coming back for more so Becky was over the moon to be going back with her boyfriend, Steve. He’d travelled a lot more than her, so as well as share the culture and sights with him, Becky was looking forward to finally being able to use the line “when I was here last time…” as he had done with her so many times before. They’d planned an overnight flight on Sunday evening, escaping the sleety drizzle of a typical London January, and as they touched down in Sri Lanka, with the sun streaming through the windows waking them up to the views of Colombo below – it was for once, the perfect start to a Monday morning. They met their private driver Bandara and his enthusiasm and knowledge assured them that they were going to have an incredible experience in Sri Lanka. “Just five hours to Vil Uyana Miss Becky”, Bandara beamed. Not exactly what she wanted to by Becky Head hear after a twelve hour flight, and although the journey to Vil Uyana was hot and humid it was the ideal way to see the real Sri Lanka. Leaving Colombo through local villages, you could buy anything from cashew nuts to inflatable toys. It was fascinating to see Sri Lankan life flashing by. The immaculately dressed school children walking along the side of the road waved and smiled – it’s not like that in the UK , Becky thought. They arrived at Vil Uyana and the first thing they noticed was how tranquil it was – and it left them feeling instantly relaxed, it was pure escapism. After being shown to their room along a wooden walkway, it all felt a little bit like Jungle Book but a lot more luxurious. The rooms were beautiful, situated over the water and with the most incredible views of the paddy fields, not to mention the local wildlife in surround sound. After a fabulous meal in the restaurant, Becky and Steve spent the evening in the openair bar and after a few beers and a long chat with the waiters they seemed to have learned an awful lot about cricket! Vil Uyana is an experience in its own right but they wanted to see some of the sights of Sri Lanka. 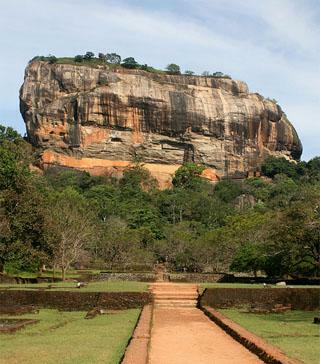 There are seven World Heritage Sights, and one of them, Sigiriya Rock, is located just five kilometres from the hotel so they decided to head off early, sporting a lovely combination of thick socks, climbing boots and beige shorts and plastered in sun cream. They were ready to climb and meant business! Becky had warned Steve about the last time she was here when she was bombarded by smiley Sri Lankan men desperate to help her up to the top for a small donation, but oddly enough this time they didn’t seem to be keen at all. Perhaps it was the socks and boots combo, or possibly her six foot Kiwi boyfriend. It wasn’t the easiest climb but the views from the top are the best views of Sri Lanka. Looking out over the surrounding gardens and the giant Buddha in the distance is truly breathtaking. Their time in Sri Lanka went far too quickly – but they crammed in a lot. They visited Kandy with its stunning colonial architecture, an elephant orphanage and stopped in every spice garden they went past. Absorbing every last sight, sound and smell of Sri Lanka they possibly could and storing them away in their memories. As Steve was a huge fan of diving, and with the Maldives only 45 minutes away, Becky had arranged five nights at Soneva Fushi, a Robinson Crusoe style island hideaway for the ultimate in “getting away from it all”. They headed to Malé where they were transferred over to Soneva’s very own lounge while they waited for their seaplane. The 30 minute wait flew by as Becky and Steve sipped freshly squeezed juice in a room smelling of lemon grass and menthol. Their plane was called, and after following the barefooted pilot (who incidentally looked like he had just stepped out of Top Gun) onto the plane, they took off over the ocean. The view from the plane was simply stunning – the contrast between the blanket of dark blue ocean and the turquoise atolls was amazing. The seaplane landed and they were whisked over to the island by speed boat and greeted with ice cold coconut juice. From their hectic life back in London, Becky and Steve welcomed the theme of “no news, no shoes”, threw their flip flops in the drawstring bag and headed to their room ready to continue their adventure. They had their very own Mr. Friday who declared he would help them with their every whim. This was the ultimate paradise, after all. But at that point in time they had no whims other than the secluded beach in front of their villa which was calling their names. Steve was into diving and Becky had made a promise to give it a go – despite her fear of all things fishy – just to see what all the fuss was about. Standing at the edge of the water and watching the black-tip reef sharks glide by it took all the courage Becky could muster to take that first tentative step into the water. If she was going to make the most of their holiday, she had to put this fear to one side – and with one hand scrunched up tight so the fish couldn’t nibble her fingers, and the other clinging onto Steve for dear life, she dipped her face into the water and began to snorkel. It took a few attempts of filling her mask with water, and choking on salt water by breathing in when her snorkel was in the water but once she relaxed into it, Becky became mesmerised by the most beautiful assortment of fish she’d had ever seen. The colours were hypnotizing, and before she knew it, Becky had been out in those crystal waters for two hours. It was official, the Maldives had cured her phobia. Most days followed the same pattern – every afternoon they would return to their room, laze on the day bed with a drink and play cards until the sun set. Then it was Becky’s favourite time of day – getting ready for dinner. The ritual began by running the bath in their private outside garden, choosing a CD from the selection Mr. Friday brought them on their first day and, glass of wine in hand, relaxing into the hand carved wooden bath. That night, after a delicious meal of fresh fish and a long and lovely night in the beautiful Me Dhuniye Bar talking about the fish they’d seen and what Steve hoped to see on his dive the next day, they grabbed a buggy and headed back to their villa. It was starting to feel like home and sitting out on the daybed, Becky gazed up at the stars and was amazed how beautiful they looked – she had rarely been a stargazer but there was something special about that sky. At that moment, they saw seven shooting stars fly across the sky and out of nowhere Steve proposed. It took Becky, and Steve for that matter, completely by surprise. Of course she said yes, and when she asked him what made him ask he simply replied, “It just felt right”. That was the magic of Soneva Fushi, it made everything feel right. With no ring they decided to get one from the jewellers on the island. Becky didn’t want to hang around the jewellers shops like a bridezilla while she waited for Steve to come back from his morning dive – so she booked herself a spa treatment and treated herself to a little more luxury. Once Steve returned and Becky had successfully pretended to listen to ten long minutes of stories about his dive trip (when all she could actually hear was the sound of wedding bells) they went to the jewellers and bought the most perfect blue sapphire ring from Sri Lanka. Arriving back at the hotel, Mr. Friday had surprised them with a candlelit dinner outside their villa, complete with champagne and a table covered in orchids. It had been the most wonderful holiday, and who knew they’d come back engaged? They left Soneva Fushi on the seaplane, and before long they were back on the flight to London. As Becky sat there staring at her engagement ring (which was far too big but she insisted on wearing it), she tried her very best not to talk about weddings too much. She didn’t want to put Steve off too early. But as they walked out of the arrivals lounge to see their families smiling from ear-toear and holding a plethora of flowers, wedding magazines and champagne – it was too late – the planning was about to begin. At least they knew everyone approved of the proposal! When it comes to holidays, sometimes only the very best will do. 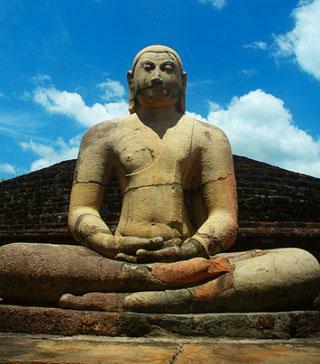 So go ahead and fall in love in Sri Lanka.